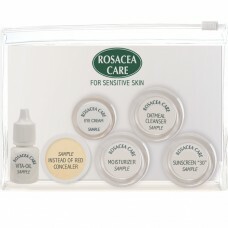 Home » Our Products » SAMPLE KIT 6 "Skin Revival"
Great way to test our five leading products PLUS our bestselling - Instead of Red - The Ultimate Concealer. Rosacea Care is the most comprehensive skin care line in the world, which was developed specifically for rosacea. Due to the variety and the different characteristics of our products we recommend that you test our products before a product is ordered in the normal size. Oatmeal Cleanser. Gentle, non-irritating and effective Cleanser that leaves the skin feeling clean and supple. Includes colloidal oatmeal for anti-inflammatory and anti-ithch effect. Moisturizer. Richly moisturizing and calming, with Willowherb Extract to reduce redness while soothing the skin. L-Alpha Bisabolol and other chiral ingredients provide excellent anti-bacterial and anti-inflammatory benefits as well as aid in healing. Paraben free. Eye Cream. Feeds and nurtures the tender skin around the eyes. Soothing, anti-aging and anti-wrinkling, with sun-protecting Titanium Dioxide. It helps in the healing of capillaries that can sometimes leak blood in the eye area, while Borage Oil provides a kind of "tea" for sore eyes. Paraben free. Can also be applied to other parts of the face and forehead. Sunscreen "30". Our All-Natural Sunscreen "30" contains 13.5% of Zinc Oxide, which provides broad spectrum protection from UVA and UVB exposure and also helps in calming irritated skin. Vita-Oil. A very light, soothing oil that quickly penetrates and moisturizes the most sensitive and delicate skin. Contains esters of Vitamins A, C & D. Our deepest moisturizer. Instead of Red - The Ultimate Concealer. Concealer that does double duty. It’s called Instead of Red, because while it conceals redness, it also helps to reduce it. A rich array of ingredients comforts the skin. A gentle hint of yellow goes with all complexions and ... YES... it conceals the redness, completely. Start with the Oatmeal Cleanser, followed by Moisturizer, Vita-Oil, and the remaining products until you have tried them all.